Reference number for this case: 14-Oct-54-Fouesnant. Thank you for including this reference number in any correspondence with me regarding this case. Heure: 09:20 - 22 p.m. The area of Fouesnant seems to be privileged fot reports of interplanetary demonstrations or phenomena - as you want - which currently agitate the public opinion. There had been ten days ago the weird appearance of Gouesnach whose some children of the public school had made an account, at the same time original, curious and puzzling by this fact that five school children had said the same thing without to have spoken together. Here after Gouesnach, a similar phenomenon was observed in the very borough of the canton of Fouesnant, but by night this time, whereas in Gouesnach the saucer evolved around the bell-tower in full midday. We excuse ourselves to put in the high-speed motorboat of the well-knoen conveyor of Fouesnant who was the principal witness of the oddities observed in the south-finistère Thursday evening, but that is necessary for logic of the relation and because of concordant observations. 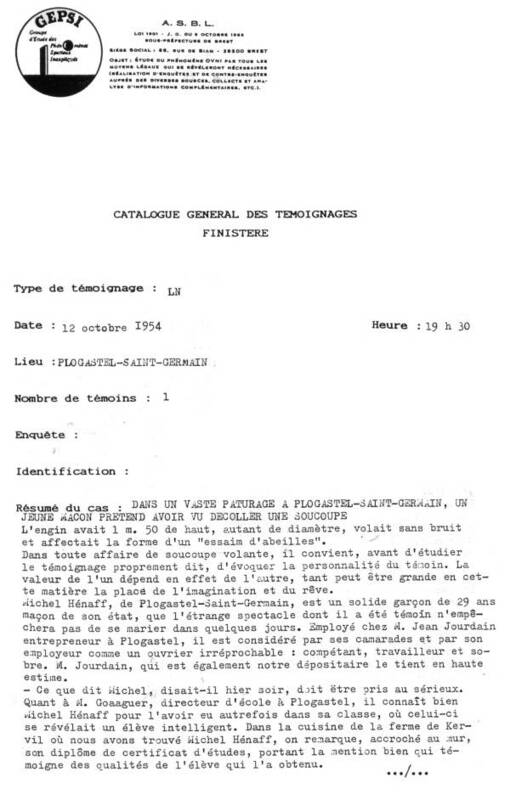 The website indicates that on 14 October 1954 in Fouesnant, France, there was a sighting. 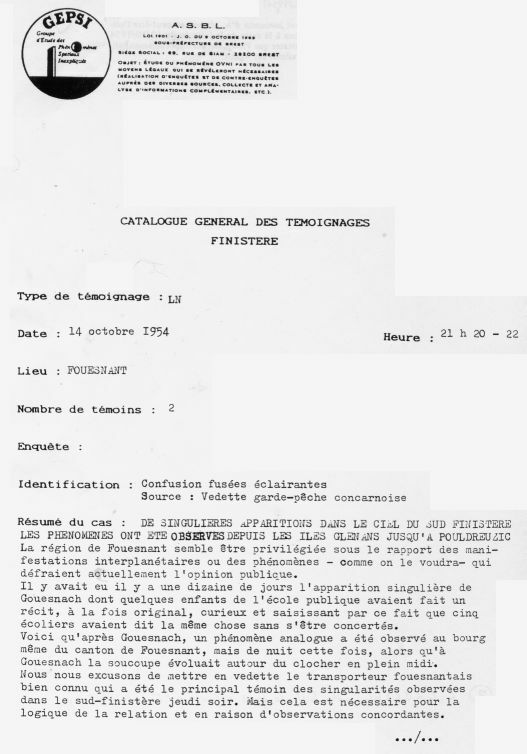 The website indicates that the source is Vallee, Jacques, Computerized Catalog (N = 3073). [ge1] File record, GEPSI ufology group, France. 1.0 Patrick Gross March 30, 2009 Conversion from HTML to XHTML Strict. First formal version. Additions [ud1].